Growing availability of amino acid-based formula in pouches, in tandem with smaller conventional containers such as tubs, their sales have witnessed a remarkable rise. Manufacturers are focusing on employing innovative packaging solutions for infant formulas, such as ready-to-use plastic bottles that facilitate firm grip. This further appeals to convenience of busy parents, who find it hard to prepare multiple bottles while tagging along time-constraints. A recently published analytical report of Transparency Market Research (TMR) elucidates key companies underpinning growth of the global amino acid based formula market, which include Nestlé S.A., Mead Johnson Nutrition Company, Danone, Abbott Laboratories, and Ausnutria Dairy Corporation Ltd. A key trend gaining momentum is development of organic infant formulas based on amino acid, such as Earth’s BEST Organic Infant Formula and Baby’s Only Organic Dairy Formula, which meet FDA regulations for infant nutrition. According to the report, the global amino acid based formula market will register a splendid volume CAGR of 8.5% between the period 2017 and 2026. 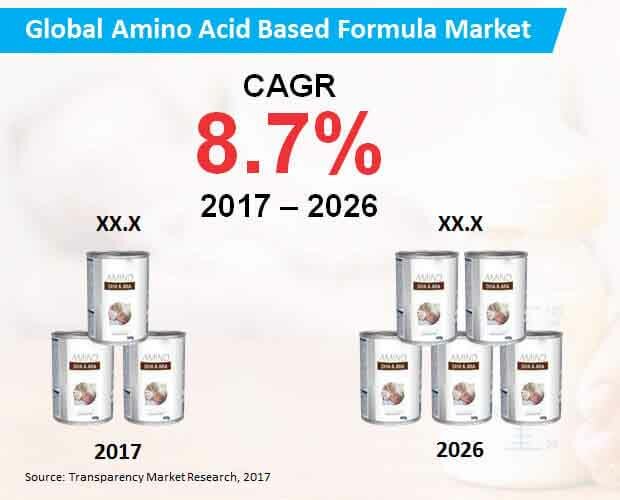 Revenues from worldwide sales of amino acid based formula market are envisaged to close in on nearly US$ 1,900 Mn by 2026-end. With the rise in GHDI of consumers in developing countries such as China, India, and Singapore, discretionary spending of households has gained an uptick. This has significantly reflected on demand for premium products among consumes. Parent want to offer their children with the best provision available in the market, and premium infant formulas are no exception. Several premium amino acid based infant formula have been introduced in the market, such as PurAmino, and The Honest Company Organic Premium Infant Formula. Penetration of premium amino acid based infant formula is further expected to gain momentum, with growing cases of hypoallergenic diseases, malabsorption, and malmetabolism among young infants worldwide. Increasing Women Workforce to Create Demand for amino acid based formula market? Steady narrowing of gender gap in employment statistics and the labor market has been recorded since the recent past. According to the International Labor Organization (ILO), participation of women in jobs reached nearly 50% in 2015, and the number is likely to exhibit steady surge in the upcoming years. With the lifestyle of these women becoming busier, its influence on birth rate as well as breastfeeding has been remarkable. This is significantly rubbing off on demand for infant formulas, such as amino acid-based infant formula. With rapid growth in health and wellness industry worldwide, probiotics have gained a paramount importance in food products, and in infant formulas as well. As probiotics enrich beneficial microbes in human stomach for proper gut functioning, they are being considered as vital ingredients in infant formulas. Recent studies have showcased effective management of hypoallergenic diseases and modification of gut microbiota in children when fed with amino acid based infant formula containing probiotics. Preference for such infant formulas have therefore increased among parents worldwide, which in turn is paving lucrative avenues for infant formula manufacturers. North America will continue to spearhead the global amino acid based formula market, in terms of value as well as volume. Asia-Pacific excluding Japan (APEJ) will record the fastest expansion in the market through 2026. On the basis of product type, revenues from sales of amino acid based formula market with lactose content will remain significantly larger than those from its lactose-free counterpart. However, mounting incidences of lactose-intolerance among neonates have meant that, sales of lactose-free amino acid-based formula will register a relatively faster sales expansion through 2026, in terms of both value and volume. Based on application, amino acid based formula market will continue to seek the highest sales in new born segment. Infants will also prevail as a major application area of amino acid based formula.